When the Houston Rockets pried Omer Asik away from the Bulls with an aggressive offer sheet, the most pressing question (after “Who?” and “Him?”) was if he could maintain his effectiveness with greater playing time. As a backup center in Chicago, the towering Turk had spent only 15 minutes on the floor per game. But in that limited sample, there were intriguing indicators that he could be a valuable big man. He was an elite rebounder — averaging more than 17 boards per 48 minutes — and his defensive rating was 92, which meant he surrendered fewer points per possession than Dwight Howard’s career-best. Now, Asik is considered a “surprise,” despite being a very similar player to the one we saw as a reserve on the Bulls. In truth, he’s gotten better. His rebounding rate is slightly up, his free throw shooting has improved, and he’s committing fewer fouls (a consequence of needing to stay on the floor, one category in which he’s slipped is shot-blocking). 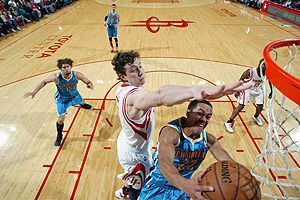 Asik has become more comfortable on offense and is now supplementing those wounded-circus-bear reverse layup attempts with new tricks, such as a cutting catch-and-kick to the corner after rolling off a bone-melting pick at the top of the key. In general, he’s proved that his success in Chicago could be replicated on a larger scale, even if some of that success was bolstered by playing alongside Joakim Noah and the Bulls’ army of smothering wraiths. Asik’s not the only player making a convincing argument that an enhanced workload has minimal impact on productivity. Kenneth Faried of the Nuggets and Nikola Pekovic of the Timberwolves have duplicated the scoring and rebounding rates they put up as underused benchwarmers, and it’s easy to forget that the potential of current superstars Kevin Love and James Harden was once questioned because of minute distribution and non-primary roles. While minutes and performance naturally dovetail — a guy plays more when he plays better, duh — the point here is that success on a limited level should be viewed as a selling point, not as a liability. This season has introduced a new crop of talented players who’ve had their potential contributions stymied by a lack of playing time. Eric Bledsoe, the insatiable defensive demon on the Clippers, has the misfortune of sharing both the point guard position and a diminutive stature with MVP candidate Chris Paul. Per 48 minutes, Bledsoe is averaging 23 points, seven rebounds, seven assists, two blocks, and four steals. But he only gets to do his wolverine-on-amphetamine shtick for a paltry 19 minutes a game. The Clippers haven’t paired Bledsoe and Paul in the backcourt together very often, but the results of having two prawn-sized guards on the floor haven’t been glorious. Of the team’s multitude of lineups, those featuring the duo are among the least effective — and with the Clippers’ lavish depth, why screw around? Those eager to witness how many soft humans Bledsoe will gleefully devour if given serious tick will have to wait — he’s been exceptional as part of the rugged second unit and is surely untouchable until Paul decides whether to re-up with the team as a free agent. JaVale McGee is in a different predicament. While the Nuggets have a decent starter at center in Kosta Koufos, he’s not an entrenched All-Star preventing McGee from seeing enough action. Their productivity is similar, but McGee is the one with absurd athleticism (he’s gotta be the only guy who can catch a Zach Randolph jumper out of the stratosphere off a flat-footed leap) and the player currently leading Denver in scoring per minute. Outside of McGee’s asthma, the impact of which is tough to gauge, the main issue seems to be that Koufos simply works better with the other four starters (Ty Lawson, Andre Iguodala, Danilo Gallinari and Faried). According to the stats on 82games.com, that quartet is +56 in around 350 minutes with Koufos, and -42 in 67 minutes with McGee. The issue might be the Faried/McGee combo, as only one lineup with the pairing has a positive plus/minus this season. Still, we’re talking about small distributions of minutes, and it falls on coach George Karl to tinker around until his team’s two best players (at least in terms of win shares per 48 minutes) merrily coexist. But considering his reluctance in granting Faried playing time last season, McGee will likely be stuck around 20 minutes a game for the foreseeable future. A situation with an easier solution is unfolding in Detroit, where the Pistons have been hesitant to supply rookie Andre Drummond with serious floor time. Despite his grotesque free throw shooting, he’s easily the best player on a team mired neck-deep in the rebuilding bog. The explosive center out of UConn is averaging 17 rebounds and four blocks per 48 minutes and leads the miserable franchise in true shooting percentage, rebound rate, and defensive rating. Coach Lawrence Frank has publicly questioned the idea that Drummond’s fantastic play will be duplicated on the same level with more minutes per game. He’s wrong. More importantly, there’s no downside to letting a blossoming star learn the ropes on a team that’s going nowhere. Even if it’s far-fetched to assume that statistical freaks like the Knicks’ Chris Copeland — currently averaging 30 points per 48 minutes on 56 percent shooting, much of which was amassed in garbage time — are secret threats to win the scoring title, dogmatic coaches who bench young players until they’ve been through a mandatory crucible of cultivation aren’t necessarily helping their teams. Instead, doubts voiced by conventionalists like Frank look more like a defense against criticism that they’re managing minutes poorly. Yet when Drummond finally gets major PT and produces accordingly, he’ll proclaim such success was the result of taking calculated baby-steps. Thanks for nothing, Larry. There are plenty of reasons that quality players are sapped of playing time — among them, talented teammates, silly lineups, and stubborn coaches — but professional basketball is too hard for someone to rack up great numbers without having the ability to do it more frequently. Prepare the bunting now for Tiago Splitter’s 2013-2014 Most Improved Player award.